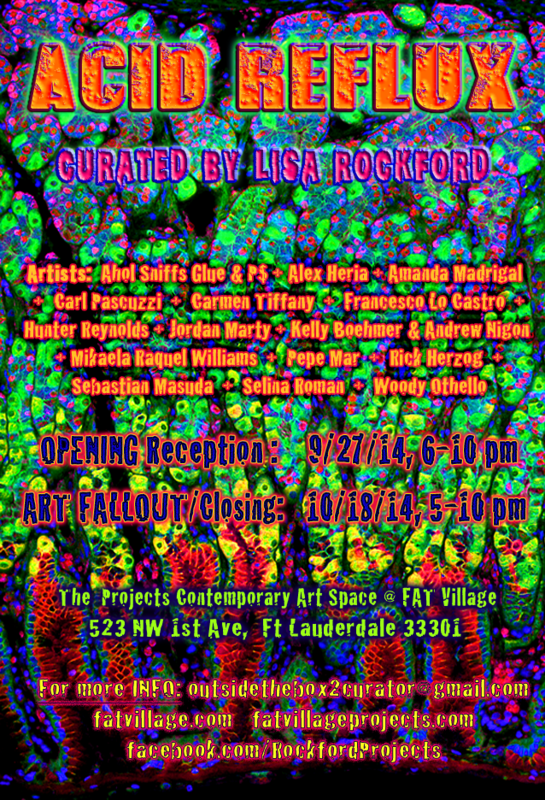 ACID REFLUX: Take a “TRIP” into the Weird, Surreal & Colorful world of 17 artists from South Florida. Psychedelia meets the digital age via Sculpture, Installations, Photography, Painting, & Video art. Housed within the 8000 Sq. ft converted warehouse known as The PROJECTS Contemporary art space in FATVillage Arts District. 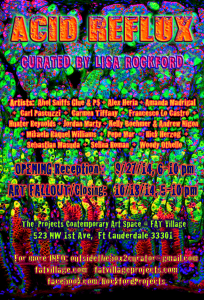 Aid Reflux opens as part of the Flager Village ART WALK on 9/27. The Closing Reception is part of the ART FALLOUT Extravaganza, where all downtown Fort Lauderdale Art Venues will be open on one night, 10/18. Lisa Rockford, Juror, received her MFA from the School of the Art Institute of Chicago. She is a tenured Assistant Professor at Broward College. Lisa began curating Contemporary art exhibitions in her position as Art Services Director of the Dittmar Gallery at Northwestern University in 2000 and has curated and juried numerous group exhibitions in South Florida, collaborating with prominent art professionals as guest judges.